Pérez, born in El Salvador, where both his grandfather and father both played professionally for C.D. FAS, the club with which Pérez would finish his career. He migrated with his family to the United States when he was 11 and gained his U.S. citizenship in the mid-1980s. He chose to forego college. During his fourteen year career, he played professionally in the United States, France, Sweden, Saudi Arabia and his native El Salvador. Although born in El Salvador, he gained his U.S. citizenship as a youth and earned 73 caps, scoring sixteen goals, with the U.S. national team between 1984 and 1994. He was a member of the U.S. team at the both the 1984 Summer Olympics and the 1994 FIFA World Cup. He was the 1991 U.S. Soccer Athlete of the Year and was inducted into the National Soccer Hall of Fame in 2008. In 1982 he signed with the Los Angeles Aztecs of the NASL. Pérez also spent time with the Tampa Bay Rowdies before ending up with the San Diego Sockers. 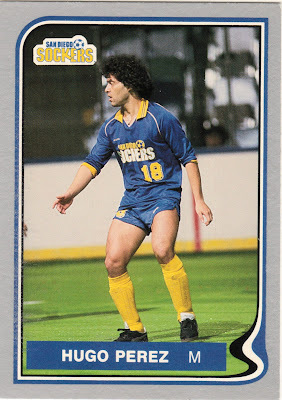 In 1988, he was the championship MVP when the Sockers won the MISL championship. That summer he joined Ajax during the team's pre-season. Ajax manager Johan Cruyff expressed an interest in signing him, but the Sockers refused to release Pérez. In 1989, he played for the Los Angeles Heat of the Western Soccer Alliance. Cruyff then attempted to work a transfer for Pérez to Italian club Parma in 1990, but Parma needed Pérez to play in the World Cup in order to get him a work permit. Pérez was part of the 1990 World Cup Roster, but when U.S. coach Gansler left Pérez off the U.S. team that traveled, due to a question of match fitness due to injury, this nixed the move to Italy. Instead, Pérez moved to France where he played with Red Star Paris. From France, Pérez moved to Swedish First Division club Örgryte IS then Saudi Arabian First Division club Al-Ittihad. In 1994, he returned to the United States and played in the 1994 World Cup and after played for the Los Angeles Salsa of the American Professional Soccer League. Hugo played with the Salsa while negotiating a contract with C.D FAS. The Salsa folded at the end of the 1994 season and Pérez made his last move, to El Salvador First Division Club Deportivo FAS, commonly known as C.D. FAS. In both of Pérez' years with the club, 1994-1995 and 1995-1996, C.D. FAS won the El Salvador championship. He retired in 1996 from professional soccer. Pérez was a member of the American squad that competed at the 1983 FIFA World Youth Championship and 1984 Summer Olympics. He also helped the USA qualify for the 1988 Summer Olympics and the 1990 FIFA World Cup, which he missed when he tore ligaments in his leg playing for Red Star Paris, a French Second Division club. He was named U.S. Soccer Athlete of the Year in 1991. He played 73 international matches for the US between 1984 and 1994, in which he scored thirteen goals. At the 1994 FIFA World Cup, Pérez played in only the second round game against Brazil.